It was Wednesday morning, July 10. We were scheduled to be admitted for induction that evening at 7:00. I’d been on bed rest for high blood pressure for a week, and finally decided it was time to get off my couch, do some last-minute things around the house, and make sure everything was packed and ready to go before we left for the hospital. The night before I had suffered a bit of a pregnancy meltdown. I was so tired of being stuck at home on bed rest – I was lonely, extremely uncomfortable, and also terrified of the induction. I cried frustrated tears to Mr. Right, then went and took a bath and sobbed and sobbed until I couldn’t cry any longer. He came in and asked me what I was worried about – I realized it was stupid to be both so READY to not be pregnant anymore but also so TERRIFIED of the childbirth that was required to get her here. The crying wore me out, I popped an Ambien and slept for ten glorious hours. Wednesday morning Mr. Right cooked me a big breakfast, then left me to get some work done and run last-minute errands before baby got here. So back to the chores – after putting away all the laundry and finishing my bag, I started feeling really sick… and hot. I climbed onto my bed to rest, thinking I had overdone it. A few minutes later… woosh – my water broke. As soon as I felt the sensation, I jumped off the bed, and water spilled on the carpet. Thankfully none got on our bed. I high-tailed it to the bathroom (as quickly as a giant pregnant girl can run), and climbed into our bathtub as my water continued to flow out. I called Mr. Right and told him, “My water just broke,” and he was so shocked all he could muster was, “I’m on my way home,” and hung up before we could talk anymore. As I stood there, I wondered if all of a sudden giant contractions would hit me like a freight train… but they didn’t. I had been having contractions for ten days, and I didn’t feel anything stronger than I’d been feeling all along. I was still standing in the bathtub when he got home, afraid to leak all over our house. When he got home I finally got the nerve to climb out, get dressed, grab some last-minute items and head for the car. I wore a horrendous giant black t-shirt and work out shorts with flip-flops for the trip to the hospital and fretted that I hadn’t had time to take a shower that morning (I was hoping to have my hair done for labor – so vain). We drove to the hospital, both of us in total shock that I was actually in labor on my own, after waiting for what seemed like an eternity for the moment to arrive. We got settled into a room and hooked up to machines. There was meconium in my water when it broke, so the nurse hooked me up to a machine that would flush out all of the dirty water and clean it so that when Wrenn was born, she wouldn’t inhale it and get it in her lungs. They had trouble hearing her heartbeat, so in went the internal monitors to better hear her heartbeat, as well as measure the intensity of my contractions. I got an IV and they started pumping me full of fluids, and we waited for the contractions to ramp up. Once we got settled, Mr. Right handed me a small, square box from Neiman’s. 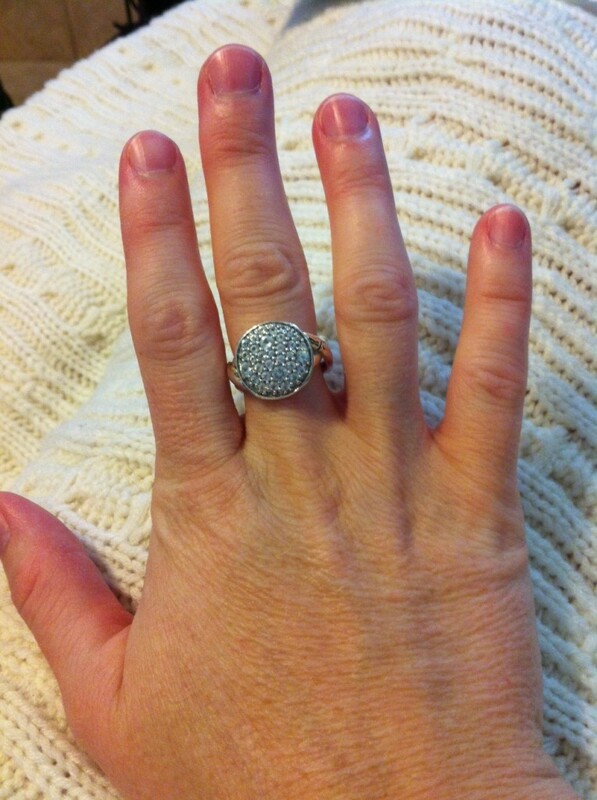 A push present – a gorgeous, sparkly cocktail ring. He told me he wanted me to have it before things got intense, before I was on any drugs, and before I had that gorgeous baby to gaze at. Throughout the day, as things got harder, he would distract me with admiring that gorgeous ring, and I wore it on my swollen finger the rest of the hospital stay. The contractions started to ramp up. Stronger and stronger, but not strong enough or fast enough, so after a few hours, they added some pitocin. And that’s when the contractions got REALLY strong. Even the nurse, whom we just loved, told me that my contractions were pretty intense and offered to give me some pain medicine until it was time for the epidural. I wanted to be tough – I could totally handle the pain, even though it was uncomfortable. And that’s when Mr. Right stepped in. I’m so glad I listened to him. I got the drugs, and it was the best thing I did all day. It gave me an opportunity to rest for a few hours before it was time for the epidural. It took the edge off of the pain (I could still feel the pressure from the contractions, but not that sharp pain that had been with them), and felt well enough to let family members take turns coming back and hanging out with us for a few hours. I came into the hospital dilated to a 3, but there was a lot of effacing that had to be done before I could progress to a 4. What seemed like half a day later, I finally made it to a 4… the contractions were even more intense, and it was time to get my epidural. The epidural wasn’t bad at all. The anticipation of the epidural? Now THAT was bad. It was about as painful as a steroid shot in the hiney, but sitting on the side of the bed, with intense contractions, waiting for the doctor to stick me in the spine with a giant needle was terrifying. It was one of the many moments that came during the day where I got really nervous, but I knew I didn’t have a choice, so I would just have to do it. Next time I have a baby I won’t be nervous at all – it was a non-issue. It took a little while to get the epidural calibrated correctly to take care of the pain. It never totally masked the pain like I had hoped, but it was definitely better than nothing. The weirdest part was not being able to feel my legs. After the epidural, I continued to hang out with Mr. Right and various family members as we waited for the big moment to arrive. It was turning into be a pretty enjoyable day. I am so glad you shared this! I know it must be a little hard to be so vulnerable, but I’m sure that everyone appreciates your honesty and frankness. I’ve never heard of a push present, but love the idea and that Mr. Wright thought to get you one. He is so sweet to you and I love that about him. I’m not pregnant yet, but my worst fear about pregnancy has been the epidural and I was even looking up information on it yesterday which only scared me more. I’m very glad to hear that it is not as terrifying as I thought. I’ve had to have many steroid shots in the hip, my lung drained from my back, and a kidney biopsy through my back so I’m sure now I”ll be able to do it since you’ve been through it so bravely. I also don’t think you are vain at all for thinking about showering and having your hair nice for delivery. I’m hoping I’ll have time to curl my hair. Lol! Gotta look nice for that baby! I love you guys ! Thanks for sharing this !